ArenaChicks.com » Blog Archive » Meet the ArenaChicks in Philly this weekend! Meet the ArenaChicks in Philly this weekend! Don’t miss out on the biggest women’s wrestling convention ever! This Saturday, August 27th, in Philadelphia, the Arenachicks will appear at the K&S Wrestlefest “A Hot Summer’s Night” convention! The Arenachicks scheduled to appear include Amber O’Neal, Angel Orsini, Sassy Stephie, Jessicka Havoc, Dyvne, Mia Svenson & Sumie Sakai! Plus you’ll get the opportunity to meet many more stars of wrestling including Torrie Wilson, Madusa, Candice Michelle, Shelly Martinez, Vladimir Kozlov and so many more!!! For more info check out the official K&S Wrestlefest website. 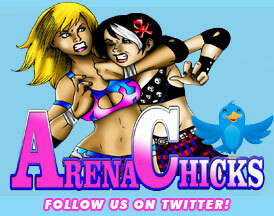 Purchase our debut DVD ArenaChicks Volume 1 by clicking on the buy it now button below. Get your limited edition Laguna Beach photo with Amber O'Neal & Christie Ricci! These are limited to ONLY 20! They will be autographed by both Amber & Christie before shipping. These will NOT be reprinted again and will be your only chance to get this special 6x10 photo. Please note this is a PRE-ORDER and there will be a delay in shipping until the photos are autographed by both. Want to see a particular ArenaChick in action? Want to bring in a new competitor? YOU can help by sponsoring their appearance by donating to us! Just let us know who you want!